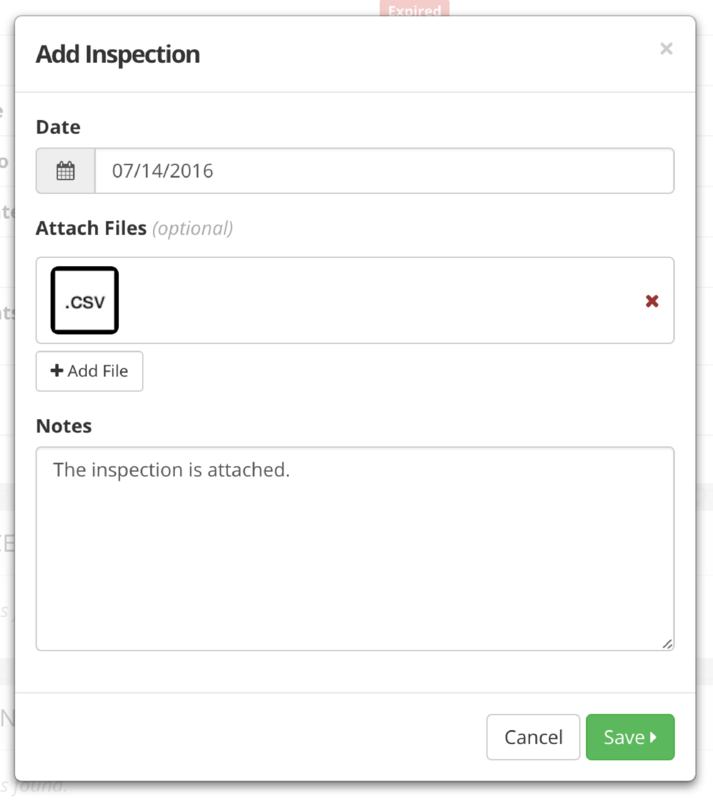 You can manage your equipment and inspection records through Hazard Scout. This guide will use "Trucks" as an example, but there are endless possibilities once you understand the tools. Before you start adding each of your "trucks" to Hazard Scout, you need to define a "Truck". To do this, you will create a type of equipment called "Truck" and setup inspection schedules, additional fields, etc. Choose "Text" for the type and press "Done"
Choose "Numeric" for the type and press "Done"
Type "Please attach the insurance verification" for instructions and make Attachments "Required"
Choose "Custom Field" for the trigger and choose "Miles" for the "Field"
Type "Please attach the inspection" for instructions and make Attachments "Required"
Now that you've defined a "Truck", let's add an actual truck to our site. Serial Number - This is a identifier that Hazard Scout will use to reference the piece of equipment. It must be unique across the entire system. In other words, you can't have a Truck "123" and a Fire Extinguisher "123". In that case, you should use a prefix like "truck-123" and "fe-123". Assign To - (Optional) The employee who is responsible for the equipment. This person will receive the open tasks when an inspection is due. Attachments - (Optional) You can attach documents like receipts or purchase orders here. Any time-sensitive documents like inspections should be attached within an inspection. Photo - (Optional) You can include a profile picture for this item if you'd like. Notes - (Optional) Include whatever text you'd like to describe the item, etc. Once you've created the truck, you can now edit the custom fields as well. Now that your truck is in the system, you may notice that the inspections are out-of-date (because you haven't added any yet). This means the assigned person receives open tasks for these inspections as well. You can also create equipment via the dataload. This is especially useful if you're working with a large number of items. For more information, visit the Dataloading Equipment page. Note you can also update custom fields using the dataload. For example, you could run a weekly update of mileage for all of your trucks. Again, see the dataload page for complete instructions. Now that you've listed your equipment in the system, we'll walk through the process of completing an inspection. The inspection will expire based on the date you select. So if you want the inspection to expire on a specific date, set your start Date accordingly.